Bancor has seen a well-received 4.74% price hike over the past 24 hours of trading as the cryptocurrency currently trades around $1.69 (at the time of writing). Bancor has seen a 7-day price increase totaling 6.73%, after suffering a 26.44% loss over the past 30 trading days. 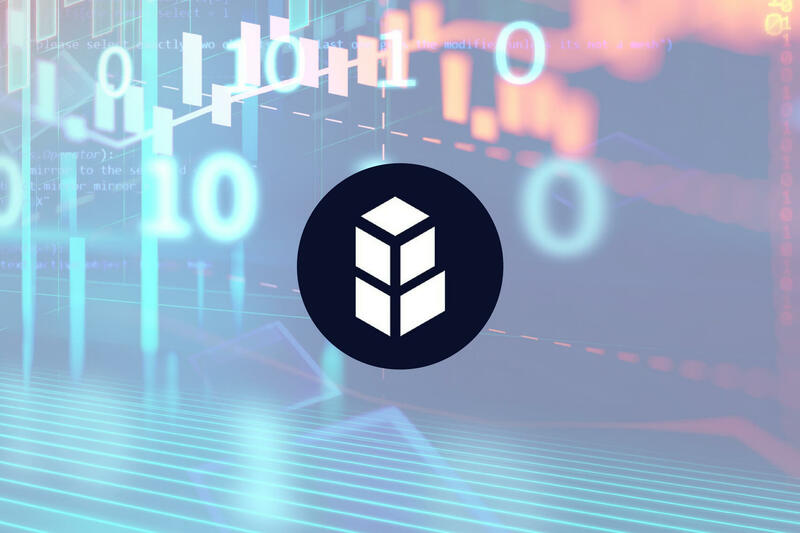 The Bancor project, which raised over $153 million in just 3 hours in its ICO on June 12, 2017, is intended to help solve the low liquidity problem experienced through the majority of low level altcoins. It allows users to convert between different ERC-20 tokens off an exchange. The Bancor project achieves this through using smart contracts to create something known as “smart tokens.” Smart tokens are the driving force behind making the conversion occur. The exchange works as the smart tokens hold reserves of other ERC-20 tokens in their smart contract which allows users to fluidly exchange between different ERC-20 tokens seamlessly. For some more information on Bancor, we strongly recommend to read our “What is Bancor” guide. Bancor is currently ranked 77th in terms of overall market cap across the entire industry. The 14-month old coin currently holds a market cap value of $89 million and has seen a significant 58% price drop over the past 90 trading days. Let us continue to analyze price action for Bancor. Analyzing the market from the long-term perspective above, we can see that during 2017, price action had experienced a significant bullish run when the market started from a low of $1.34 on July 16, 2017 and extended to an all-time high of $11.23 on January 10, 2018. This was a price increase totaling 690% from low to high. We can see that after placing this all-time high, price action went on to decline precipitously. The market had originally found support at the .618 Fibonacci Retracement handle priced at $5.11. This Fibonacci Retracement is measured from the entire bullish run outlined above. During February and March 2017, price action continued further lower dropping below the 100-day moving average to find support at the .886 Fibonacci Retracement level priced at $2.45. As April 2018 began to trade, the market had experienced another smaller bullish run as price action started from a low of $2 on April 1, 2018 and extended to a high of $5.95 30 days later. This was a price increase totaling 195%. However, price action was not able to maintain itself at these intermediary highs and rolled over once again. 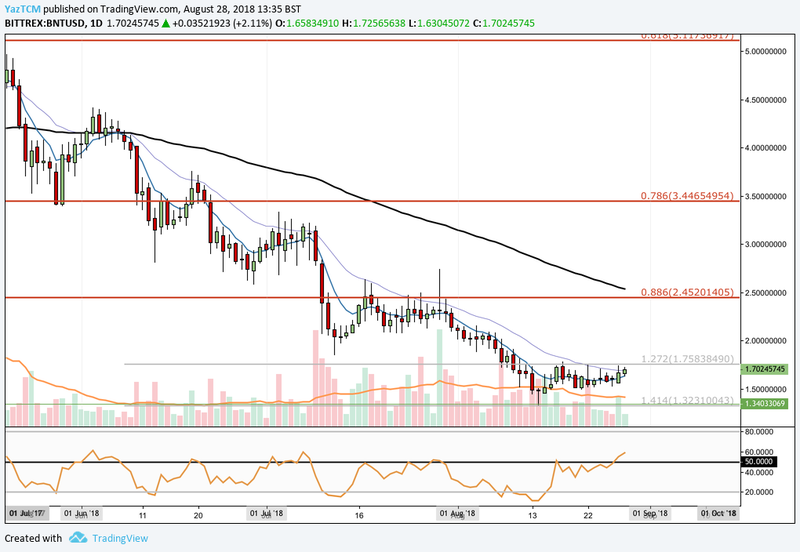 We can see that, over the past 5 months, price action has been continuously declining and has recently completed a 100% Fibonacci Retracement of the previous bullish run when price action reached the initial starting price of $1.34. Let us continue to analyze price action a little closer over the short term to highlight any potential support and resistance zones. Analyzing the market from a shorter-term perspective, we can see that the previous 5 month price decline has shown some signs of stabilization as price action has stayed above the $1.50 handle for half of August. We can see that the support at the 100% Retracement level of $1.34 was bolstered by a downside 1.414 Fibonacci Extension level priced at $1.32. This support proved to be significant as the market sharply rebounded from this area, refusing to stay there for more than a day. Price action is currently now trading at resistance outlined by the downside 1.272 FIbonacci Extension level priced at $1.75. This area of resistance has provided a decent level of resistance over the past 2 weeks but the market is persistent as it re-tests the level. If price action can be pushed above the resistance highlighted at $1.75, we expect immediate further resistance to be located at the psychological round number handle of $2.00. This level has provided a small level of support in the past, and therefore this level should be expected to provide resistance as the market moves back up again. Further resistance above this level is then expected at the previous .886 Fibonacci Retracement level priced at $2.45. This area will require significant momentum to overcome due to the 100-day moving average being closely correlated with this area. Alternatively, any downside pressure is expected to be heavily supported by the $1.32-$1.34 handles. The technical indicators are starting to show some promising signs for the bulls within the market. The RSI has recently broken above the 50 handle indicating that the previous bearish momentum has shown signs of fading. If the RSI can sustain this break above the 50 handle, we can expect this market to continue to regain some of the losses received over the past few months. Similarly, the moving averages are beginning to show some signs of favor toward the bulls as the moving averages position themselves to print a bullish crossover within the market. The 7-day EMA (blue moving average) has recently pointed itself towards the 21-day EMA (purple moving average). If the 7-day EMA can cross up above the 21-day EMA this will signal a bullish crossover within the market indicating that the bullish pressure is building. Let us continue to quickly analyze price action for Bancor relative to Bitcoin. Analyzing the market relative to Bitcoin as displayed above, we can see that Bancor had experienced an incredible bullish run as price action started from a low of 14,575 SATS on December 7, 2017 and extended to a high of 75,999 SATS on January 10, 2018. This was a 435% increase in price from low to high. We can see that since placing the high, price action has continued to decline throughout the majority of the trading year. 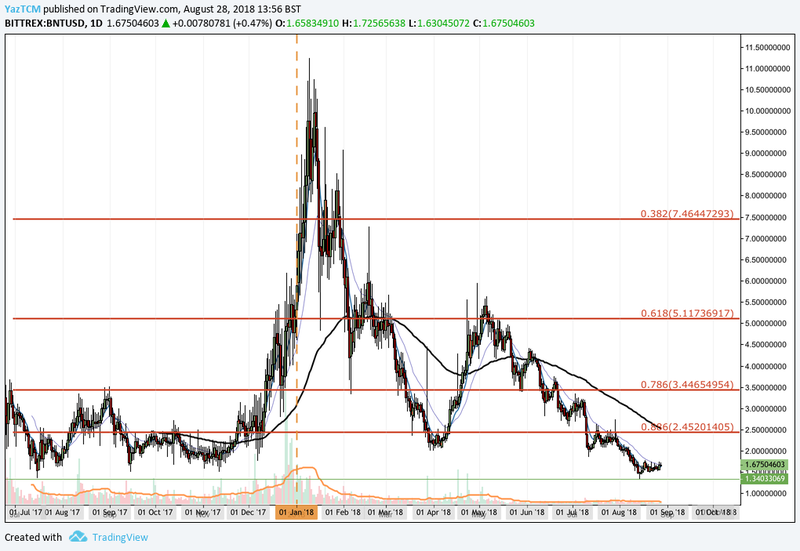 It has recently hit the .886 Fibonacci Retracement level priced at 22,000 SATS and rebounded. The market is currently now trapped within a range bound between 22,000 SATS as the lower boundary and 27,500 SATS as the upper boundary. If the market can break above the .786 Fibonacci Retracement priced at 27,500 SATS, we expect the 100-day moving average to provide immediate resistance which is currently hovering around the 35,000 SATS handle. Further resistance can be expected at the .618 Fibonacci Retracement level priced at 37,800 SATS. Alternatively, any bearish pressure is expected to be supported by the lower boundary of the range at the .886 Fibonacci Retracement level priced at 22,000 SATS. Further support below can be expected at the downside 1.618 Fibbonacci Extension level priced at 17,000 SATS.